Alan joined NCS in 2001 upon settling in Connecticut with his family following more than ten years in Europe. His fondest memories of life overseas involve many years with a dedicated small group in connection with membership at Eden Baptist Church in Cambridge, England. Alan credits his wife Sherry as most influential in his Christian walk. She is a licensed clinical social worker with Regional Hospice in Danbury, CT. They have been married for nearly 40 years and have two children. Kailee Grace is attending Anderson University in South Carolina, and Christian is an emergency physician at the University of Cincinnati Medical Center. 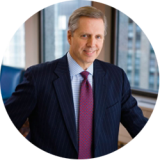 Alan is a partner in the global executive search firm Russell Reynolds Associates where he works from New York City and Stamford, CT. He specializes in CEO and board level work within the industrial manufacturing sector. Alan worked previously with The Coca-Cola Company in general management positions at divisional and regional levels in Europe and Eurasia. His prior employers were the J.M. Smucker Company and Procter & Gamble. Earlier Alan served in the U.S. Army as a general’s aide and in several command assignments with armor units stationed in the U.S. and overseas. He has lived and worked in Germany, the U.K., Austria and Turkey. Alan is also the former Chairman of the Board and now Board Emeritus and Advisor to The Grace Children’s Foundation in New York. Alan was born and raised in Westmont, NJ, essentially a suburb of Philadelphia, and he is a graduate of the U.S. Military Academy at West Point, New York.